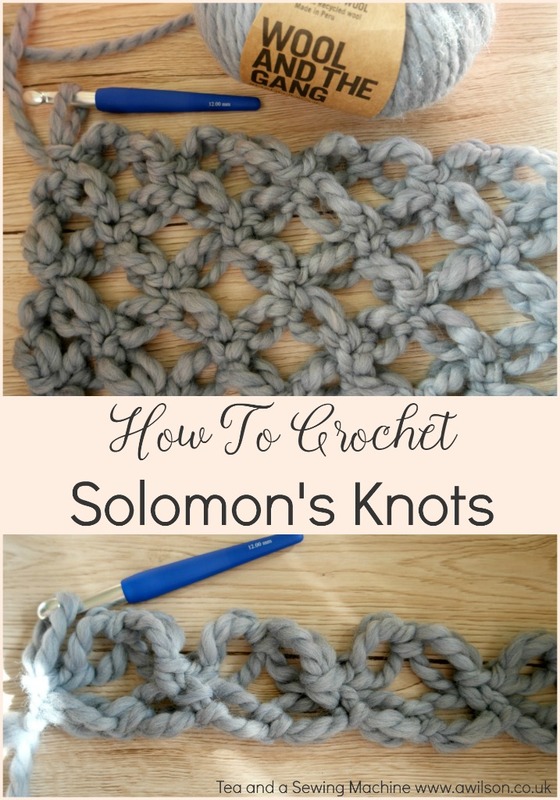 Solomon’s knots are the perfect stitch if you want to crochet something lacy. 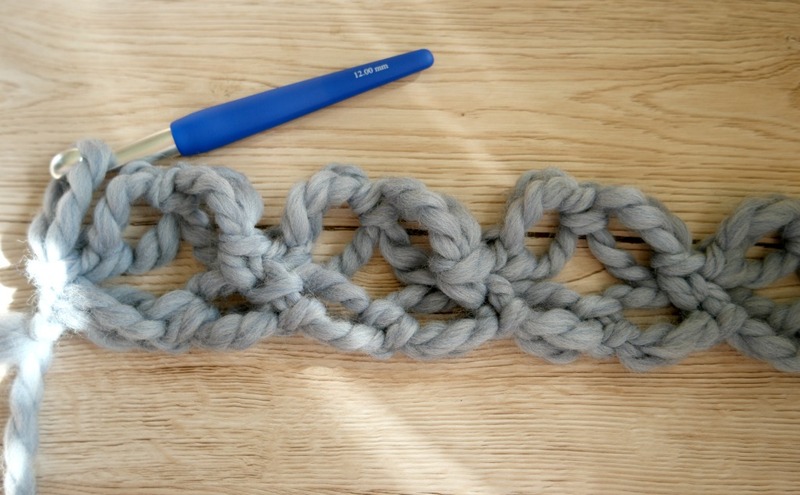 It’s a good stitch to use if you’re using a chunky yarn but you don’t want the thing you’re making to look too heavy. Recently I was sent some yarn to review by Wool and the Gang. 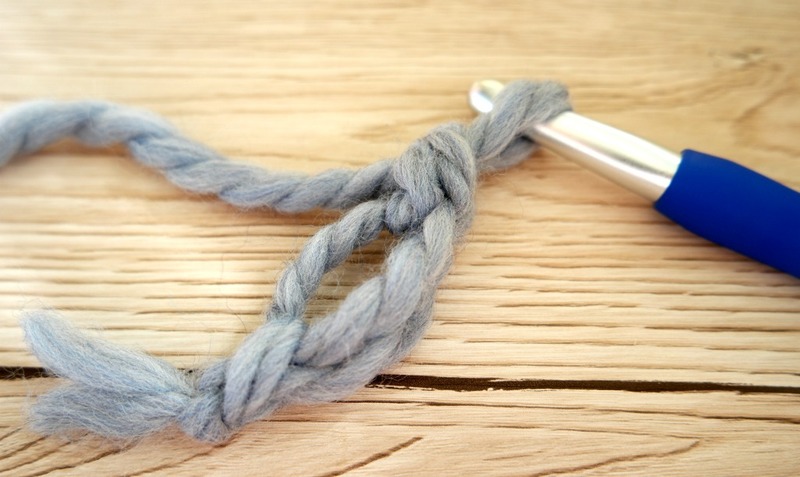 The wool I’ve used in the tutorial is Heal the Wool in dusty blue. 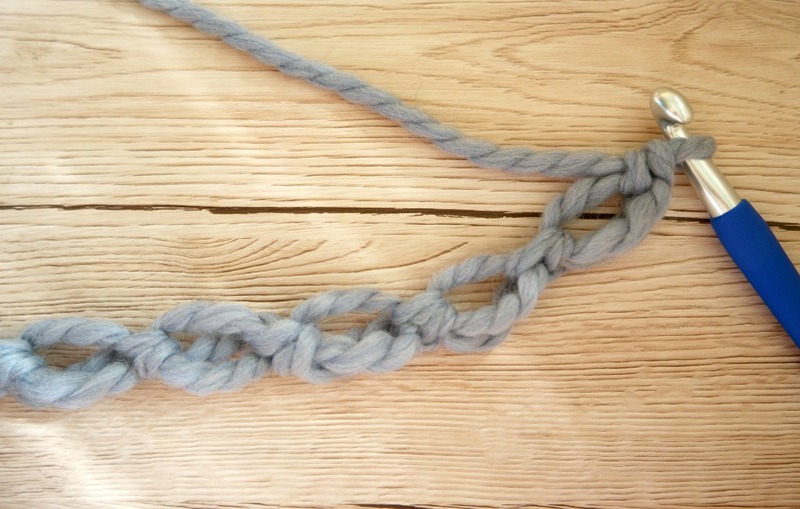 The yarn is called Heal the Wool because It’s made entirely from waste wool from the yarn making process. As well as being a pretty colour, it’s also incredibly soft! 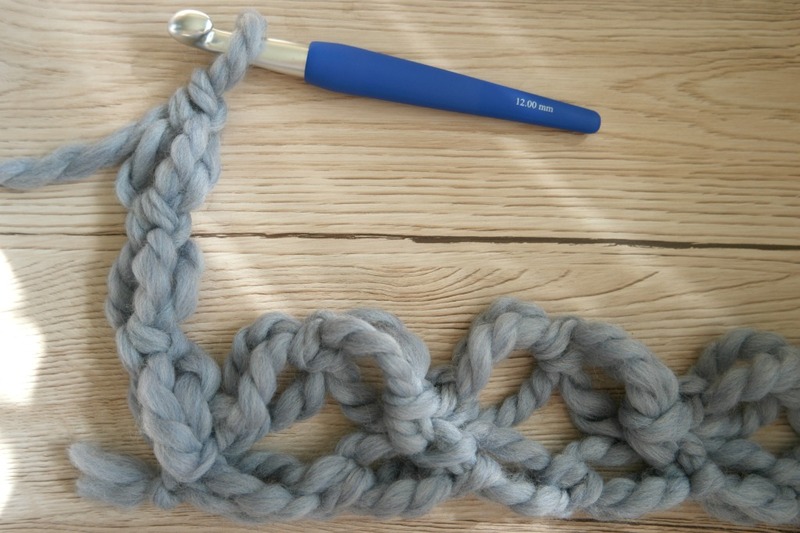 It’s perfect for making anything snuggly, from cosy cardigans to pretty blankets. Being chunky it makes up nice and quickly. I was surprised at just how chunky it was! 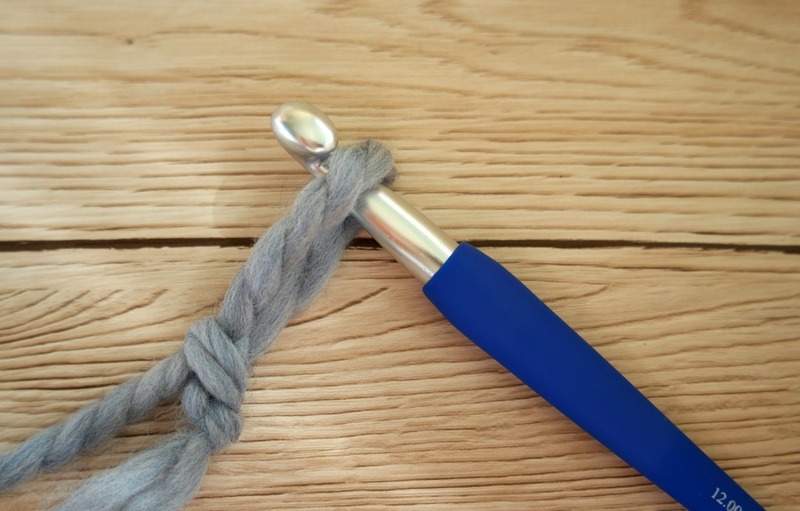 In fact i had to buy a 12 mm crochet hook because I didn’t have a hook big enough! In keeping with its environmental credentials, the packaging it came in was all recyclable with lovely smart labels and a heavy duty paper bag you could use to store your project in if you wanted to,without worrying about the knitting needles poking through. I’m hoping to make it into a cardigan, but I’m not sure at the moment how much it’s going to make up. So it might be a cardigan, but it might be a scarf if there’s not enough. Once I’d decided what to make, I wanted to choose a stitch that would do justice to my pretty wool and look good as a cardigan. I initially decided on shell stitch as that’s one of my favourites. Once I’d crocheted a few rows though, I found that it was very dense. I wanted something lacier, so I undid the shells and tried again with Solomon’s knots. I was much happier with the results! Once I’ve finished the cardigan, I’ll post the tutorial. 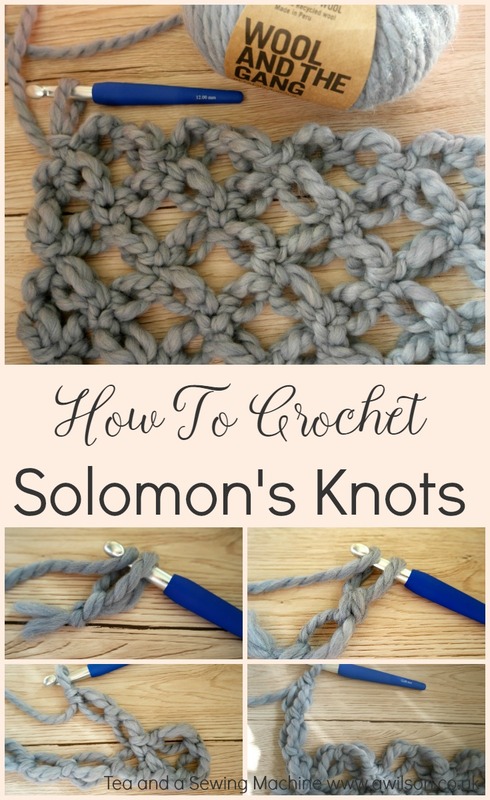 In the meantime, here’s a tutorial showing how to crochet Solomon’s knots. You’ll need to make an even number of stitches. At the end of the first row you’ll make 2 stitches for turning, then 3 stitches for turning at the end of each row after that. The stitches are grouped in 4s to make a diamond, with a half diamond at the end of each row. Each diamond is made up of 2 stitches from the current row and 2 from the previous row. The exception to this is at then start of each row, where the diamond is made up of 1 stitch from the previous row and 3 turning stitches. Please note that being British, I have used British crocheting terms! 2. Make a 2nd ch, but don’t pull it taut. Leave it as a loop about 4 cm long. 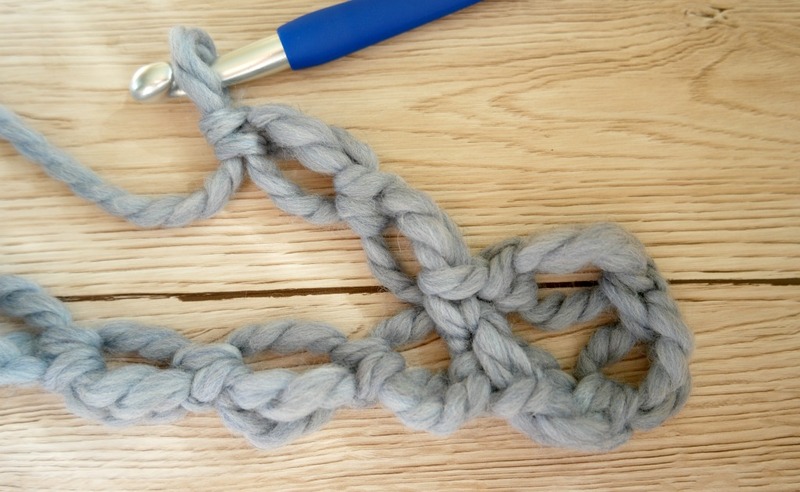 If you’re using yarn that is lighter, you’ll need to make your loops smaller. 3. Yrh. Don’t pull this taut either! It needs to be about the same length as the loop. 5. 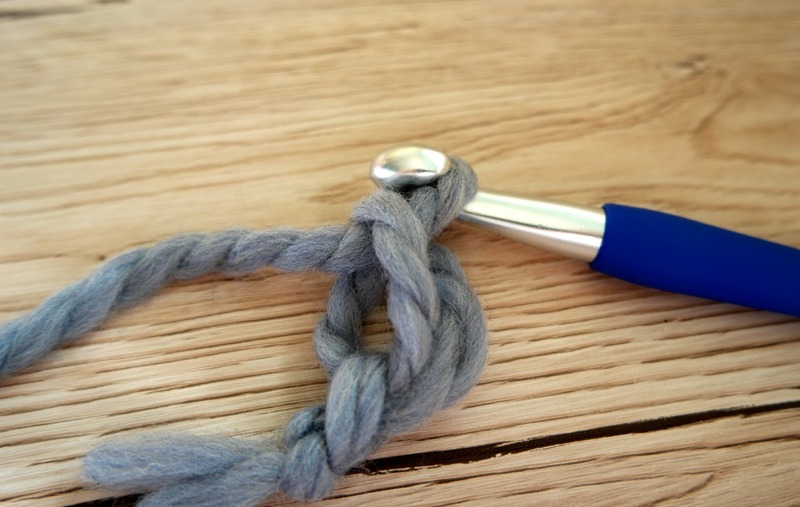 Now insert the hook between the loop and the yarn you put round the hook. 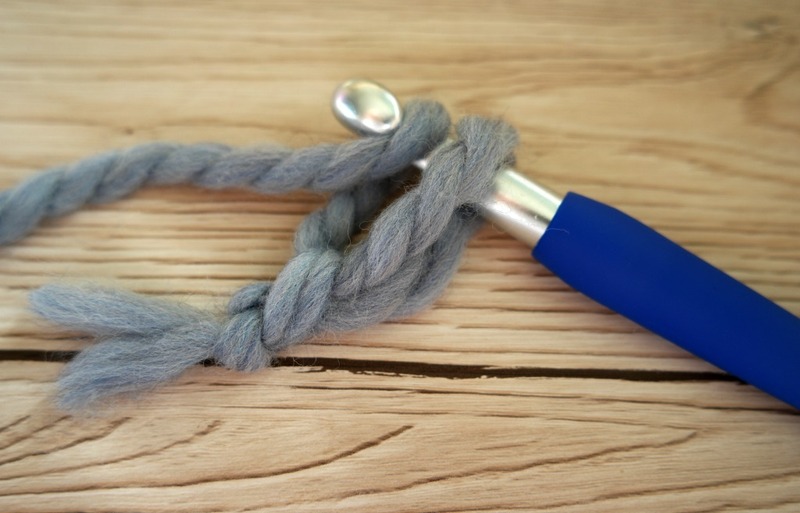 Put the yarn round the hook and pull it through. You’ll have 2 loops on the hook. 6. Yrh again, then pull it through the first 2 stitches on the hook. This makes one stitch. 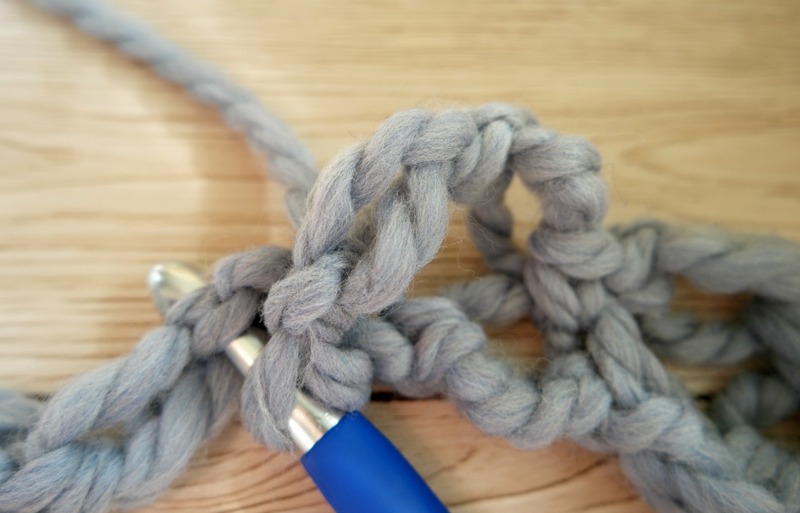 Make the next stitch in the same way, starting with the current loop on your chain. Loosen it so that it is about 4 cm in length. Repeat again from Step 3. Keep going like this until you have enough. If you’re going by length rather than by number of stitches, bear in mind that they will stretch! 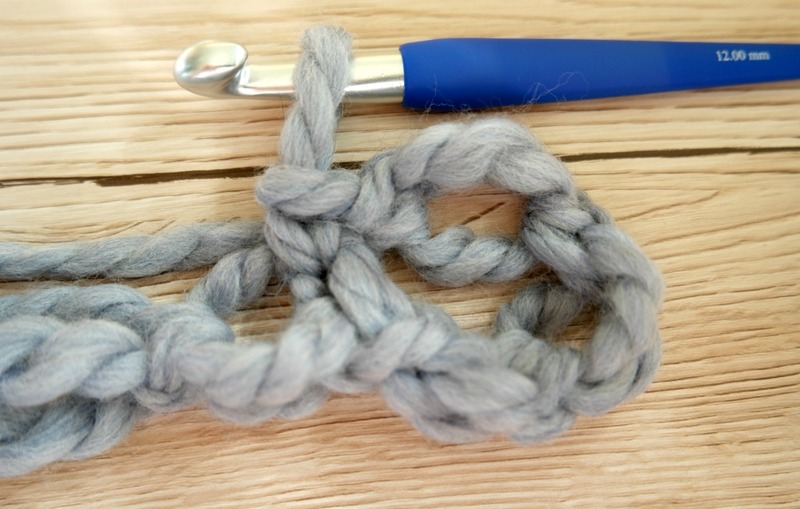 Make 2 stitches for turning your work. When you’ve made the second stitch, double crochet into the 4th knot from the hook. Make 2 more stitches. 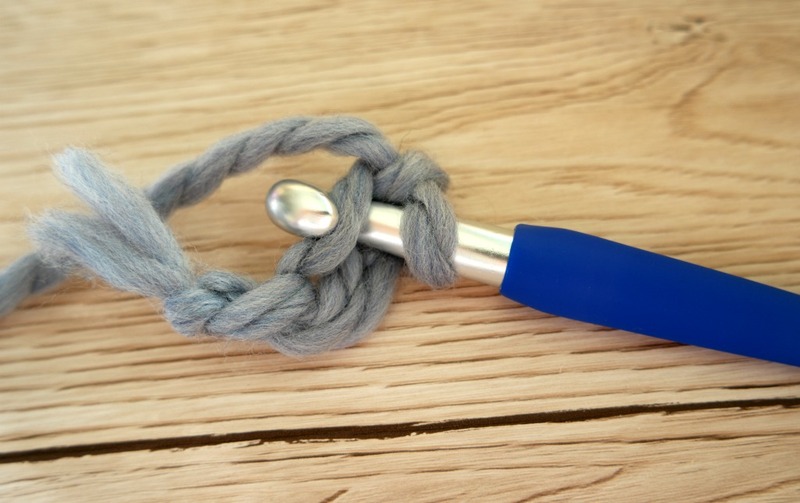 Skip one knot, then DC into the next. Make another 2, skip a knot then DC into the next knot. Keep going like this to the end of the row. Crochet 3 turning stitches. DC into the last but 1 knot of the previous row. Make 2 more stitches. 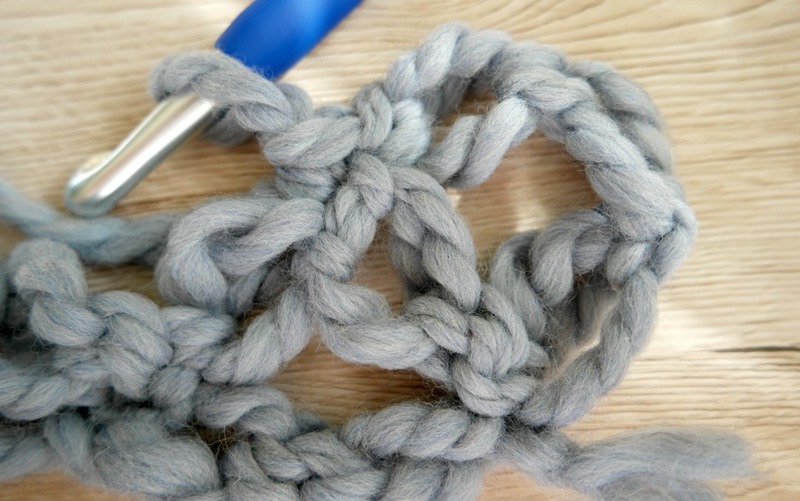 Skip 1 knot, then double crochet into the next, like you did in the previous row. Keep doing this until you reach the end of the row. 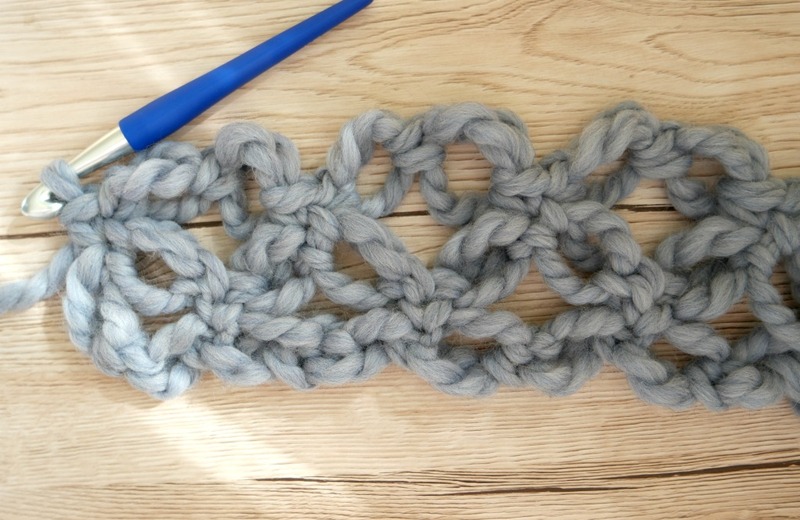 Repeat row 3 until your piece of crochet is the right size! This is such a cool stitch! Thanks for sharing!! now that’s a neat stitch! Thank you. 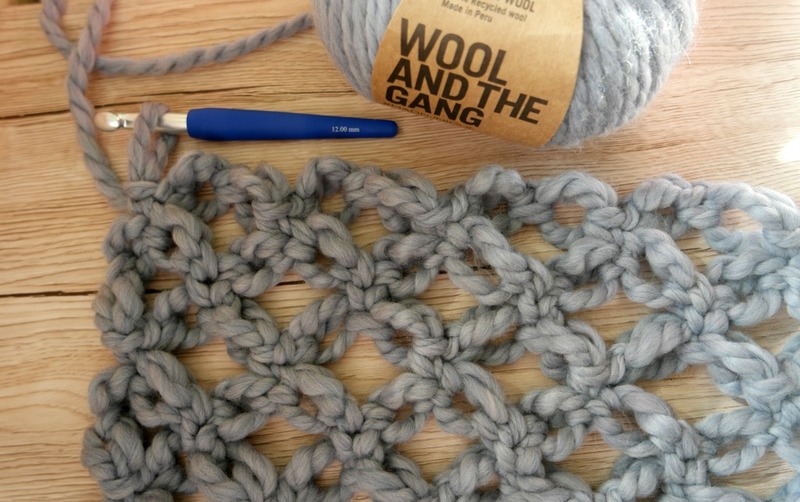 Likewise – thanks for pointing out “Heal the Wool” – such a fantastic idea! will subscribe to your blog for more posts like this.